Hello, I'm John Comeau, originally from Skowhegan, Maine, now with my permanent home in the high desert of southern New Mexico. Welcome to my home page. My old page no longer really reflects who I am at this time, but I'll leave it online as a reference. I'm not looking for a "job". I do odd programming jobs here and there, but most of my time is now devoted to following my dreams, and making them reality. Heard of "voluntary simplicity"? I started living it before I heard of the term. The only "central service" I use daily (at least when I'm home) is the Internet, and someday I hope to build the unternet to where I can dispense with that, too. Following is a list of some of my current projects, in no particular order. A lot of my time is spent trying to get others to see the danger of citizen disarmament. Without carrying a gun, one is always at the mercy of those who do; it should be considered normal and a duty of a good citizen. Unfortunately, in many if not most parts of the world, including Californistan, it's highly regulated if not outright illegal. Follow Sipsey Street Irregulars and War on Guns to keep in touch with the pulse of the gun rights movement in America. Terra preta, black earth, is remarkably productive soil found in the Amazon. Part of the secret to its superiority over the surrounding soil is the addition of charcoal powder. See Bidstrup's page for details. 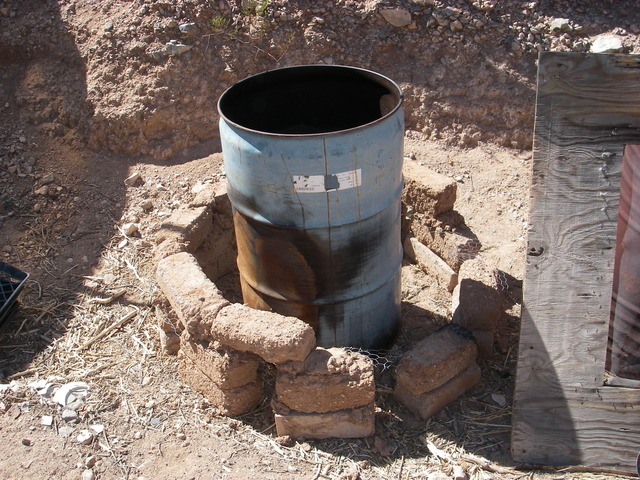 I'm working on eliminating at least my own lifetime carbon footprint by building a charcoal kiln and charring tumbleweeds and other undesirable vegetation in it. When I get it working well, I want to build another one in South Padre Island for use with seaweed. Now that Joseph Jenkins has made available his Humanure Handbook for free at weblife.org, there is no excuse to not read it. The ideas and methods outlined in this book will have immediate benefits, especially in the developing world, if people will give them a try. The desert is a harsh environment for gardening. Until I'm successful at greening the desert, hunting and gathering can and will be a way for me and a small minority of the world's population to sustain themselves. For others, it can supplement a grain diet. I've improved my accuracy with a multi-pump air rifle to where I can kill cottontails and doves quite reliably for less than a penny an animal, and very little noise pollution. Seasonal fruits and vegetables to be harvested wild are yucca blooms and fruits, wild amaranth leaves, purslane, devil's claw fruit, and prickly pear pads and fruits. Windsurfing, windskating, snowkiting, paragliding, wingsuits... free transit all over the globe if you don't mind following the wind. You can google these terms for some awesome videos on YouTube and elsewhere. In June 2008 I rebuilt my windskate sail frame with carbon composite tubing for a much lighter rig; it breaks more easily now but repairs quickly. One goal for the near term is to find a way to windsurf or kiteboard the Aleutian Islands, then on to Kamchatka and down the Kuril Islands to Japan. The rest of the world is pretty much a breeze once the Bering Strait is crossed and you're out of Russia, which is extremely restrictive on foreign travel. The icy temperatures of that water is a major consideration, too, and I'd like to find a way to solve the problem without thousands of dollars worth of high-tech clothing. When the wind isn't blowing, I usually walk, run, or bicycle to my destination, or hitchhike or bus if it's more than 10 miles or so. I'm really not happy with bicycles -- the designs haven't improved all that much in the last hundred years. I'm working on a HPV design which uses both arms and both legs, similar to these exercise machines. When and if I get something usable prototyped, I plan to show it off at Burning Man and the Kinetic Sculpture Race. Sandor Ellix Katz wrote the book, and my friend Ingrid Stenquist bought it for me. I've made several attempts, and so far have been successful with yucca bloom "sauerkraut" and cider from reconstituted frozen apple juice. At the end of July 2009, I bicycled from Columbus, NM to the Burning Man festival in Nevada's Black Rock Desert. Along the way I got rides from many friendly people and had some wonderful experiences; not the least of which was meeting someone with whom I feel very much in tune. I followed her home to Petaluma, CA, and have lived there since. The story is in my blog.